what might be holding you back. Real changes in how you eat and spend your time start here. This is the power lunch for real people. Take 30 minutes. Take back your life. It’s not about lunch, but you might like it anyway. So decide, then start small. You get your job done, so there's no reason why you can't TAKE A BREAK and do something that matters to you and FEEL SATISFIED. Eating better shouldn't feel like punishment, and your lunch break could actually take you one step closer to THE LIFE YOU WANT TO LIVE. No more excuses. Start TODAY. Breakfast matters, but it doesn't have to be the most important meal of your day. 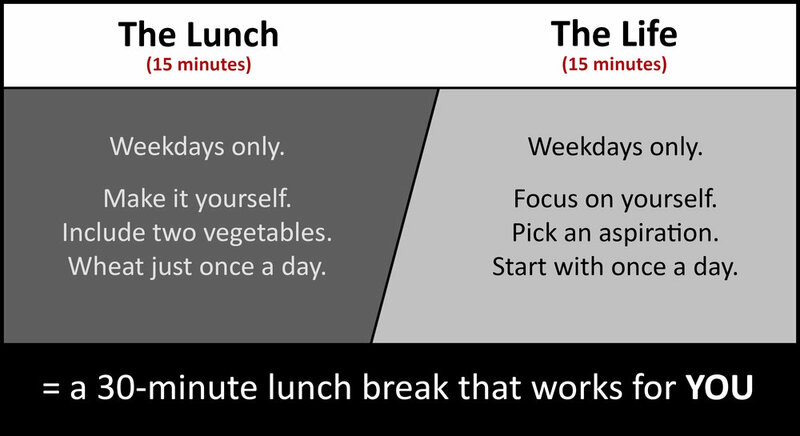 It's easier to start with lunch, and one you make yourself means better food choices. What if you could finally do that thing that you've always said you wanted to do? Has taking that first step felt impossible? Not anymore. The reason to eat better is to have the energy to do more of the things that make you YOU. Being good to yourself will inspire you to eat better. Win-win. Do you eat lunch? Then, yes. It's for you. What do you want? That's what you get. Otherwise, you should give it a try. It's a step toward the life you want. Don't wait.